The Goldfields is a region in Victoria, Australia. 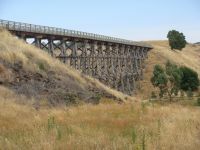 A 46km route for cycling or horseriding from Ballarat to Skipton. A shuttle bus occasionally operates the return route, sponsored by Bicycle Victoria. . Bicycle hire is available in Ballarat. 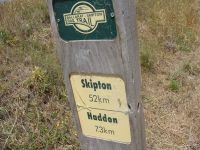 The trail has route markers every kilometre, to the next town and to the end of the trail. The surface is packed gravel, a road bike is probably unsuitable, but an urban or hybrid bike will be fine. There are shelters provided at regular intervals. From Ballarat follow Gregory St to the north of Lake Wendouree onto Ring Rd. Gregory St is quiet, and there is a cycle path following the last sections of Gregory St and Ring Rd to the start of the trail. The railtrail itself starts in the outskirts of Ballarat immediately south of the Ring Rd railway crossing. Lake Wendouree to Haddon (10.3km). Agricultural country. Golden plains stretching into the distance. This part of the trip is largely flat. There are toilets and water in Haddon right on the railtrail, next to the recreation ground. There are no other supplies available. Smythesdale to Scarsdale (3.7km). General store, pub, toilets and water in Scarsdale. The pub serves dinner 7-days, and lunch on Saturdays and Sundays. Scarsdale to Linton (12.9). This is the prettiest part of the trip, but also the hardest work. Just out of Scarsdale you will cross the Nimmons Rail Bridge, a spectacular wooden trestle bridge, which has been restore so you can cycle over it, or use the track under it. After the bridge the track ascends through bushland, to an abandoned road bridge in the cutting, then you are rewarded with a cruise down through bushland and beside lakes and dams to Linton. Linton has a general store, milk bar, and petrol station for drinks and supplies right on the trail. If you ascend the hill into the town centre, you will find the pub and a nice cafe but not much else. Most of the rest of the town has all closed up. Linton to Pittong (9.8km). There is no town at Pittong, but the neigbouring minerals factory has built a small lodge, which provides water, a shower, and toilets. There is about a 4km climb out of Linton before a downhill into Pittong. Pittong to Skipton (10.6km). The trail follows closer to the road, and the landscape tends back towards the agricultural. At the end of the trail Skipton has a general store, a pub, toilets and water. This page was last edited on 27 April 2017, at 09:17.